Where Is Baer ? : Toxaway! Waking up to the pattering of rain on the roof of the bus strengthened my expectations for an adventurous day. I hopped out of bed, got the coffee going, and grabbed the phone. Mass text messages were sent out looking for information on what creeks might be running, and who was heading out on a mission. The message responses were starting to feel unproductive as I started my second batch of coffee and the hour grew later. Then, Aeon Russo sent a message over asking if I wanted to join a team including Noah Weaver, Evan Spysinski, and Peter Ely for a mission to the Toxaway. I couldn’t respond fast enough: YES! We piled into a couple of vehicles and rallied to the Jocassee drainage, arriving at the top of the massive slide that starts the Toxaway. After a quick search we found the gauge on the upstream river right corner of the bridge. The foot gauge was reading -2 inches; we quickly started trying to discern what that actually meant. 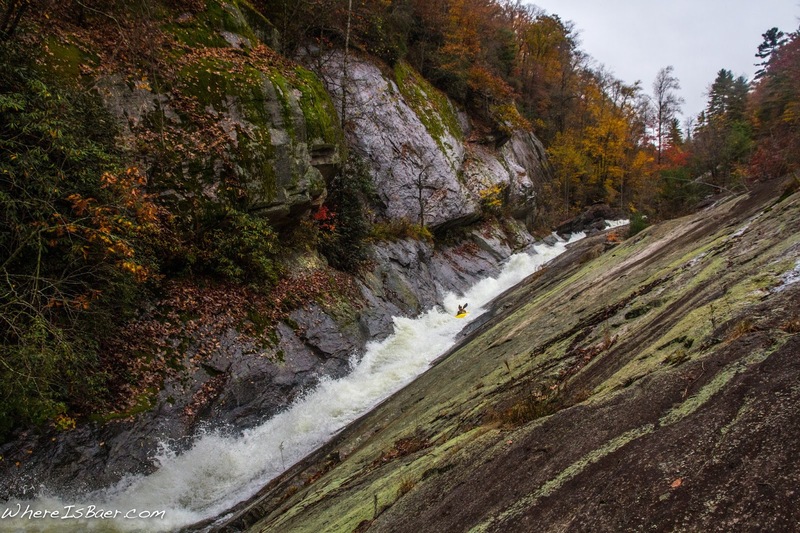 After a couple calls, I was able to get in touch with Leland Davis who talked me through a scant two paragraph description of one of the stoutest sections of whitewater in the United States, a gradient drop of 680 feet per mile. What he conveyed was simple: scout everything! The crew was relatively young, and that made me a little nervous. However, once everyone started communicating about what gear they were bringing, I felt a bit better. 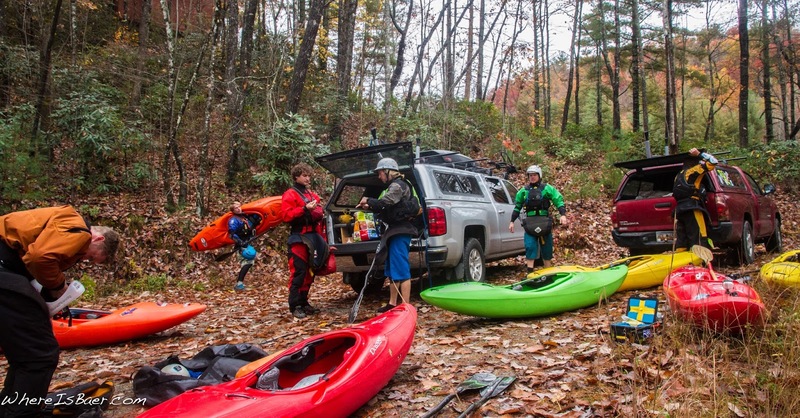 The list included medical kits, break down paddles, food, headlamps, a 20oz Red Bull, and a beer for the take out. We were prepared for war. 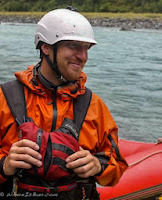 TOXAWAYfrom Chris Baer on Vimeo. The initial put in slide is a blast. 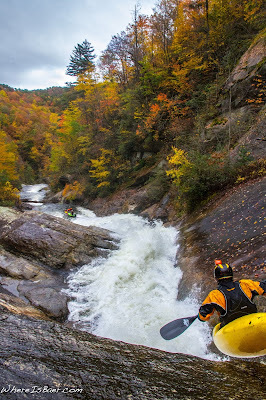 But if your adrenaline really gets pumping by the time you hit the base of this 200 yard long, low angle slide, well, it’s time to get out of the creek and head to the car. 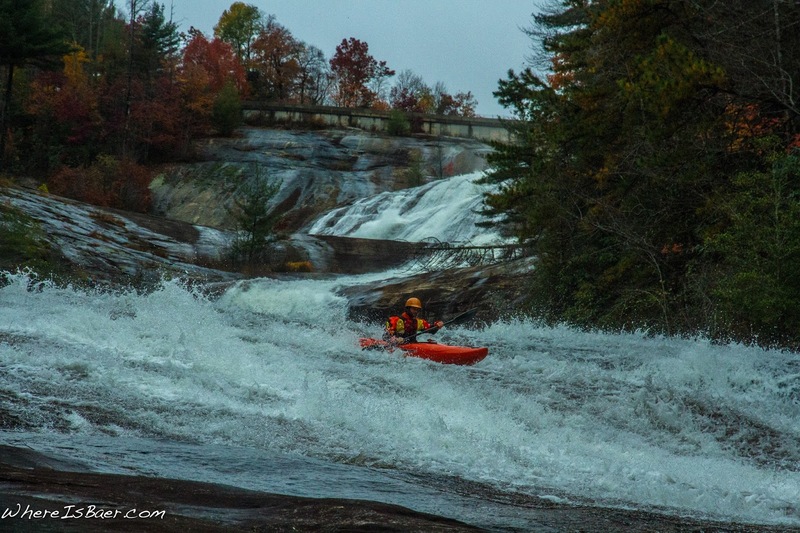 The put in slide is by far the easiest of the major rapids, and there are countless in-between rapids that take true class 5 skill. Our on-stream communication was spectacular! The crew was leap frogging well, and transferring beta smoothly. One boater would get out at the next imposing horizon line, give ultra-simplified beta, and the crew would sit tall and paddle one after the next into the unknown. 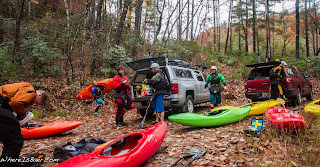 I was amazed at how a crew that had never paddled together before this run was working so well together. The big rapids appear relatively quickly, and the crew was quick and consistent about scouting, portaging, setting proper safety, getting camera shots, and keeping some solid downstream progress. Land Bridge caused a little uncertainty in us about where to seal launch. I walked out onto the rock that creates the bridge, and with a very reassuring voice I stated, “It looks so good from here!” At the base of Land Bridge the team was high on life! It’s huge and for most of the crew it was the biggest rapid they had ever paddled. 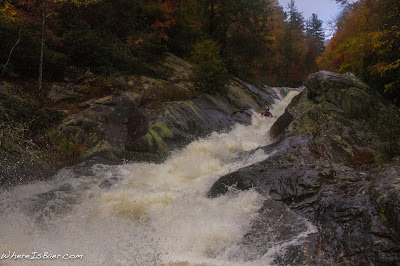 Still cheering and in ecstasy, we paddled over two small ledges before arriving at the last of the big rapids, Wintergreen. Six years earlier, I had an absolutely amazing experience on the Toxaway that I share with anyone willing to listen. This day I was able to share that experience with two new members of the “Wintergreen Blind Team”. Drew Duval was part of the team six years ago and was acting as one of our main guides for the run. He waved Gareth Tate over to his eddy and they quickly started chatting about the line. Drew spoke in a deceptive tone, “It’s a 20 footer that kind of whites out at the bottom… then just stay in the middle.” Unbeknownst to me, Gareth at least partially knew he was getting sandbagged. As Drew left the eddy Gareth shouted out, “I’m on you!” It was at this point that I knew something was not right, and hollered to Gareth that I was on him. All three boats left the lip of the falls within a second and a half. Now, I climbed on top of the right hand scout rock and peeked down at the entrance line. It was a quick glance, then an equally quick glance to the lower portion of the rapid. I didn’t want to destroy that blind sensation. Sitting back in my boat I hollered at Aeon and Noah, “This is Wintergreen, it’s a 20 footer that whites out, then be in the center”. The team raised our fists in unison, announcing that everyone was ready. 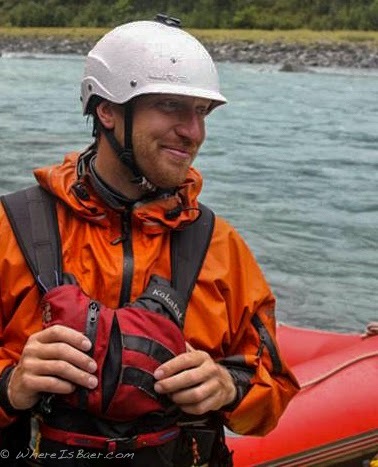 I paddled to the top of the eddy, turned, and hollered, “Have fun boys!” before sliding into the biggest rapid of the run with four other boats in quick succession behind me. Reckless? 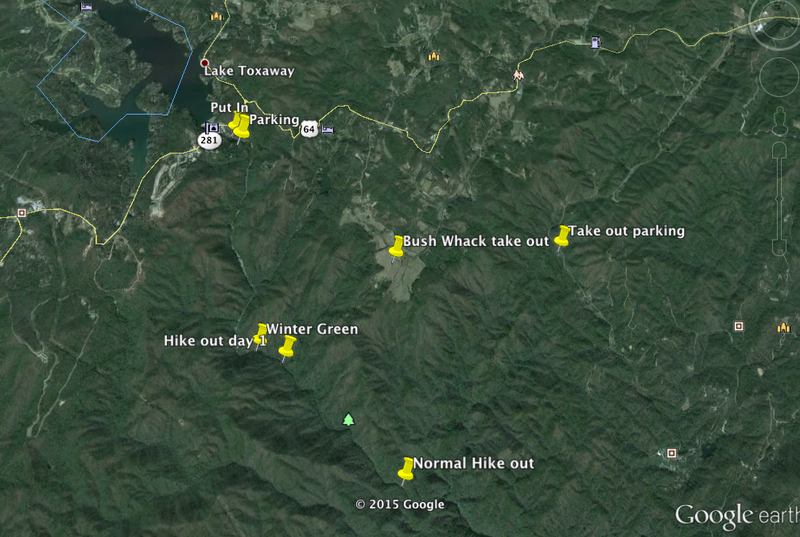 Absolutely, it is the TOXAWAY, and Wintergreen is by no means anywhere close to a 20 footer. The crew was ecstatic. Joyous cursing, laughing and hugs were shared. Almost every emotion was blasting out of everyone at the same time. Beyond the exhilaration, there was one downfall; the daylight was just shy of gone. We paddled downstream another quarter mile, ducking some logs and sliding over others, as we approached what we could barely make out in the darkness to be a portage. It was at this point the team came to the conclusion that our paddling portion of the day was over. On the left bank we could make out what looked like a trail. One last ferry for the day followed by a quick push up the bank and I was standing on our “trail”… In reality, there was no trail. We had a quick debriefing to talk about where the normal hike out road was located, and the fact that we were about to embark on a suffer-fest. Adding to the entertainment was the fact that it was distinctly dark and there were only three headlamps for five people. The crew benefited from an enormous adrenaline high from our descent as we struggled to make any forward progress. Occasionally, we would stumble onto an old forest road cut, only to be greeted with thorns. As time went on, spirits started to wane. It was close to 10:30pm and we were three hours into the bush whack when Peter pulled out a cell phone and realized that we had very marginal service. A few futile calls and we continued the struggle towards our unknown destination. Half an hour later we had climbed far enough up the canyon walls to start getting a better signal and got word out that we were, in fact, ok, but miserable. Some communication on what direction the moon rose confirmed that we were still on the right track. By 11:30pm, my legs were only good for short stints before giving out. One time, as we paused to rest, I nearly passed out. Then, the absolutely annoying voice of Siri rang through the darkness. “Point four miles to national forest road”. An exhausted cheer was expelled by all, and we resumed our slog through the bush yet again. At 1:30am, Bree McGreedy and Andrea Speed rounded the corner in the take out vehicle. We had crawled, hiked, and cursed the 1,000 vertical feet out of the gorge through amazingly thick vegetation. The lukewarm Pabst tasted like a gift from god. 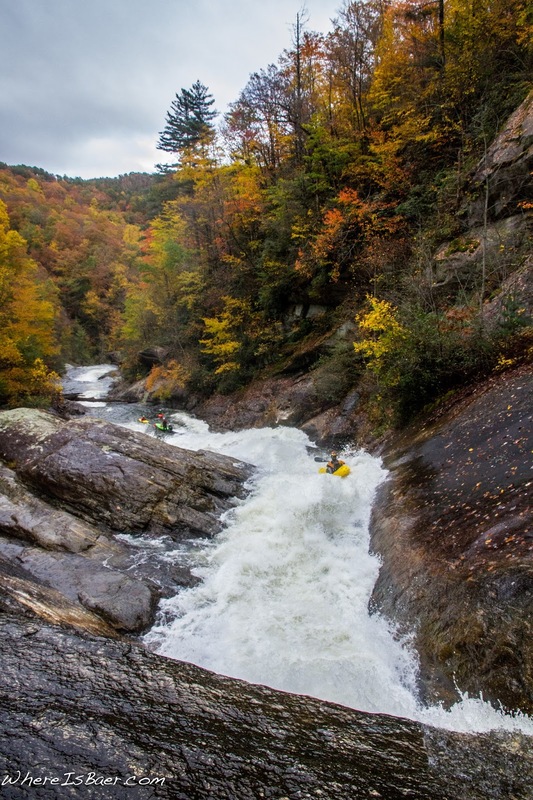 How good is the Toxaway? We spent close to six hours portaging and sliding down rock slabs and another six hours of climbing out of the gorge to the road. My body is still sore, and Aeon and I dropped in for a second lap only five days later. 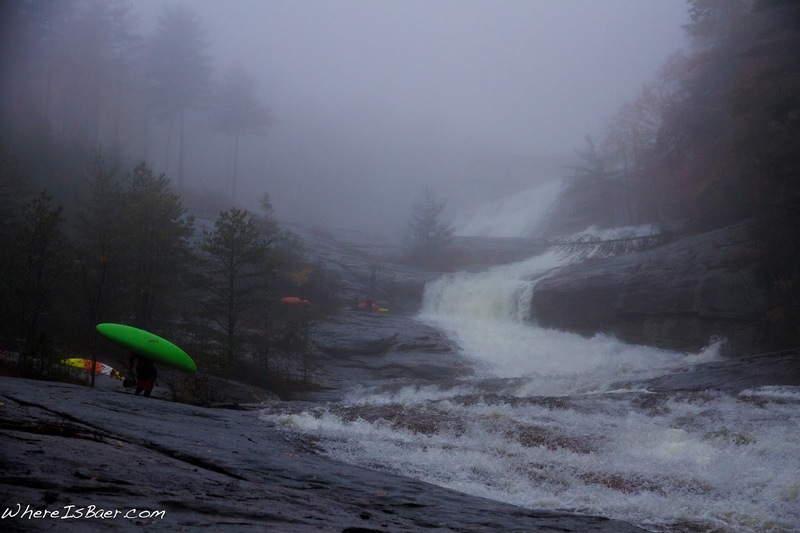 If there is an excuse for not racing the Green, it is TOXAWAY!